Nothing beats a warm bowl of homemade soup on a cool fall day. But I’m a busy guy—I don’t have time to stand around stirring a pot and chopping vegetables all day. So how do I whip up tasty, savory creations in the time I do have? I take shortcuts, using a few cheater ingredients here or some clever EatingWell cooking tricks there to get the job done faster. As a result, I can make an amazing soup just like my mom used to make (What am I talking about? STILL makes) in just 30 minutes. That’s less than the time it takes to order takeout. You can do it too. And you’ll be making a soup that’s healthier and tastier than the canned stuff most people usually turn to for convenience. Here are 5 of my favorite tricks for making delectable, healthy fall soups in just 30 minutes. Some store-bought broths deliver close to 1,000 mg of sodium per cup—the majority of your recommended daily sodium intake! When shopping, Eating Well’s Test Kitchen Manager Stacy Fraser suggests looking for reduced-sodium (averaging 500 mg/cup), no-salt-added (averaging 200 mg/cup) or low-sodium (140 mg/cup or less) stock or broth. Some canned broths are lower in sodium than others, so check the nutrition label to compare brands. Use pre-cut vegetables as a shortcut that saves time while still creating a nutritious dish. Frozen vegetables save time and money and are something you can always keep around in your freezer. Plus, when fresh vegetables are out of season, choosing frozen vegetables may deliver more nutrients, since they are usually picked and frozen at the height of ripeness. Canned tomatoes and chiles also add nice flavor without much effort. And don’t be afraid to pick up some pre-cut fresh veggies in the produce section or from the salad bar, such as diced carrots, sliced peppers and precut broccoli and cauliflower florets—they eliminate time-consuming prep. Precooked beans are a quick-cooking staple, and are a high-quality source of protein and heart-healthy dietary fiber, both of which keep you feeling full. A typical 1/2-cup serving provides about 7 grams of protein and up to 7 grams of fiber (just be sure to rinse canned beans before using to reduce sodium). Frozen boneless, skinless chicken breast, lean ground beef or lamb, wild-caught salmon fillets and lean pork chops are great, quick-cooking protein sources to use in soup. Each of these healthy proteins can be defrosted fairly quickly and, when cut into small pieces, cook in no time. And a little goes a long way: one 12-ounce salmon fillet will make 6 servings of our Salmon Chowder and one boneless, skinless chicken breast and a can of beans provide tons of protein in our Chicken & Spinach Soup with Fresh Pesto. Add depth of flavor to quick-cooking soups by using ingredients like herbs, spices, strong cheeses and flavorful meats. 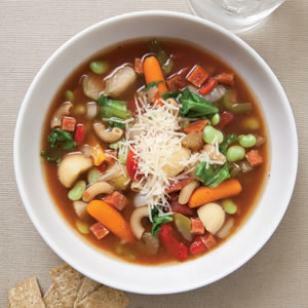 A half cup of diced pepperoni adds spicy, complex flavor to minestrone (see recipe below). Adding 2 teaspoons of dried tarragon to Salmon Chowder gives the soup a unique character. Grated Parmesan, ground allspice, caraway seeds and even peanut butter are all great ingredients to add a slow-cooked richness to a quick-cooking soup. Considering that this minestrone soup incorporates mostly frozen vegetables, it is remarkably savory and aromatic. Look for frozen soup or stew vegetables with potatoes, carrots, celery and onion in the mix to give the soup the best flavor. Although pepperoni isn’t traditionally part of minestrone soup, you’ll find it’s a great shortcut to add spicy, complex flavor. Recipe by Nancy Baggett for EatingWell.